I got up early this morning. By 6:30am I was on the road. I figured it was less hassle not to be found sleeping in the big tunnel house that I had bedded in last night. It was still cold. I oculdn’t be bothered to get my gloves out of deep within my panniers. I just alternated hands on the handlebar. One in my pocket warming up, one on the handlebar. I stopped at a delicatessen – the only shop open before 8am – and bought some cheese, ham, yoghurt and dried mushrooms. The yoghurt went well with my polenta for breakfast. The other items I saved for lunch. From Belfiore to Verona, it was just a short blat along mostly quiet country roads and a great cycle path along the Adije River. At one point I got a hearty round of applause from a group of young picnikers waking up from a night camping out on the banks of the river. The path becomes a little more exciting the closer you get to Verona. In the end I was on single track. I go crazy on single track. All thoughts of saving my energy for a long day on the bike go out of the window, and it becomes all about how hard and fast I can ride, keeping to that little line of clear ground. Dodging horses and joggers, I finally made it to Verona in one piece. Verona was worse than Venice in terms of hoardes of humans. Granted, it was a public holiday, but any notion of cycling through the old part of the city was quickly done away with. I locked the bike to a rail and wandered into the fray. 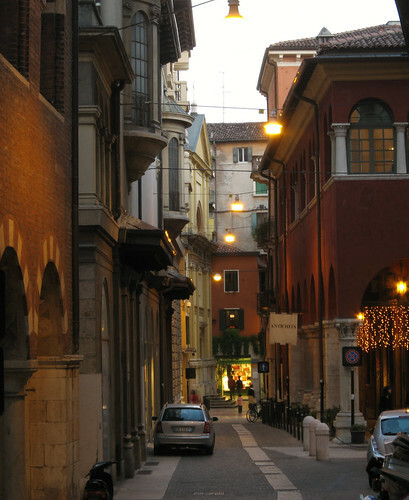 However, as it was with Venice, Verona was very nice once you got off the tourist routes. I wandered around for close to a whole day, and watched as the city dipped into darkness, the grand colloseum looking all the more impressive with the subdued lighting. Nice pictures and as an old MTBiker I know that state of trance that packs you when setting your foot on the first meter! You can’t resist- IMPOSSIBLE! I see what you mean about all the cities beginning with 'V'. I've heard of them all but hadn't realised they were all so close together. By the way – did you get the job at the Switzerland Summer Adventure Camp? I've been around that area. We visited Venice, Vicenza and Bassano. It's a beautiful area, and the history is incredible. Bassano actually had large pockmarks in the wood on the bridge from WWII artillery. I've read that both Sienna and Vernazza are somewhat car-free cities, if you get anywhere near them. @Chris J: Concerning the lighting issue: As I’ll start my tour at the end of the month (in opposite direction) and I’ll also ride along the Mediterranean I wanna bike @night when it’s getting to hot and/or dry at day. Therefore I’ve built a new light which I’ve already posted pictures that unfortunately didn’t make it through the spam filter of Rob’s travelogue. Just visit my homepage and click on “Travelogue” at the top. There you’ll find links to the pics. I’ve been testing it extensively the last nights and it’s really great – highly recommended! @Rob: If you’re riding @night here is some experience that can save your life (especially in Germany): Only ride Sunday through Thursday night! Keep away from the weekend drunk car drivers! There’s significantly more traffic Fri and Sat and on holidays! Cycling at night to escape the crowds. I can certainly understand that feeling. If you are going to make a habit of it then a stronger light might be advisable. I wouldn't sweat the fashion issue either. I have felt the same way since my first day in Japan and now just ignore it. People can feel free to go ahead and chalk it up to me being a "weird foreigner" if they wish. Awesome! You've made to the heart of Europe. Cycling over the Alps will be fun, eh! Have been real busy at work recently and haven’t been getting my daily dose of your travels until today. You have certainly made excellent progress. I visited Italy last summer and we went to Pisa and Firenze. I was very impressed with Firenze though the crowds were just nuts. It is a cool country and the food rocks! Happy riding matey. Where the hell is … no, not Matt from wherethehellismatt.com, but Rob! He's cycling in a really populated area right now, so internet access should be no problem! I'm a bit concerned!